Early view of the church, showing the residential area to the right, ca. 1900. 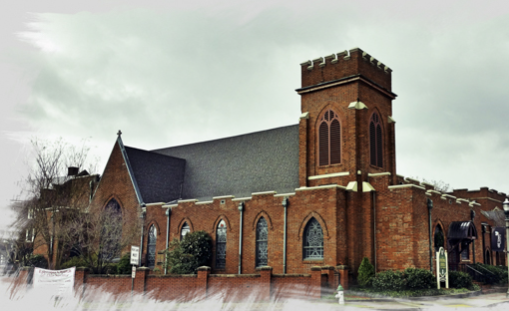 The building at the corner of Caldwell and East White Streets was built in 1872 as a simple Gothic Revival frame chapel with board and batten siding, attributed to the designer, Rev. John D. McCollough. It has undergone a number of changes over the years. In 1895, the vestibule was added. In 1908, the greatest alterations took place, when the transepts, chancel, and tower were added and the church was encased in brick. The two-story tower has a crenellated parapet, buttresses at the corners, and pointed arched openings with wood shutters. The first stained glass windows were added at this time as well. Additional impressive windows have been placed in the church over the years. 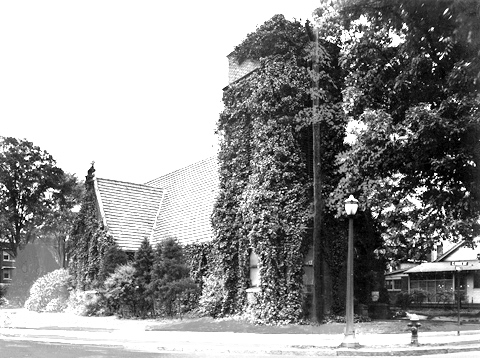 In 1922 the Parish Hall was constructed adjacent to the sanctuary along Oakland Avenue. This building contained the first indoor gymnasium available to the public in Rock Hill. In 1963, the nave of the church was enlarged on both sides and the front porch was added. The Parish hall was demolished in 1990 and a new one erected on the same site, with space for classrooms, offices, and indoor and outdoor gathering spaces.